The events of the narrative are represented as taking place on the occasion of the hostile advance of an "Assyrian" army into Palestine. The inhabitants of a certain Jewish city called "Bethulia," (properly "Betylua") can check the advance of the enemy, because their city occupies the narrow and important pass through which is the entrance into Judea (Judith iv. 7 et seq., viii. 21-24). But the Assyrians, instead of attempting to force the pass, blockade the city and cut off its water-supply. In the distress which follows, Judith, a woman of Bethulia, works deliverance for her city—and thus for all Judea and Jerusalem—by bewitching the Assyrian captain, Holofernes, and cutting off his head. 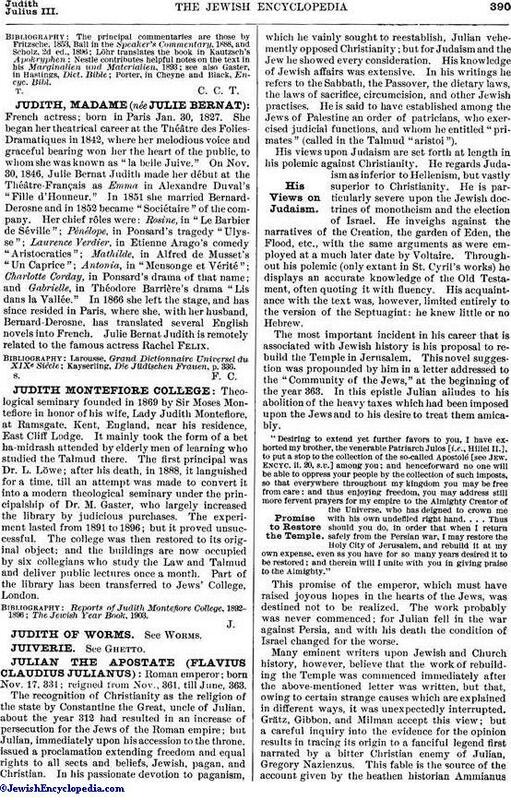 Judith is certainly one of the very best extant specimens of old Jewish story-telling, and forms a worthy companion-piece to Tobit, which it surpasses in vividness of style. Its author introduces a considerable variety of material, but all in due proportion; everything is subordinated to the main action, and the interest never flags. The principal scenes are painted very vigorously, and a striking picture is often sketched in a few words (comp. x. 10, 18; xiii. 13; xiv. 6). The poem in the closing chapter is a fine composition, plainly the work of no ordinary writer. The book has a distinctly religious trend, and is well calculated to inspire both patriotism and piety. For the history of the Jewish religion, however, it contributes little of importance. Views and doctrines which have nothing to do with the progress of the story are not introduced. 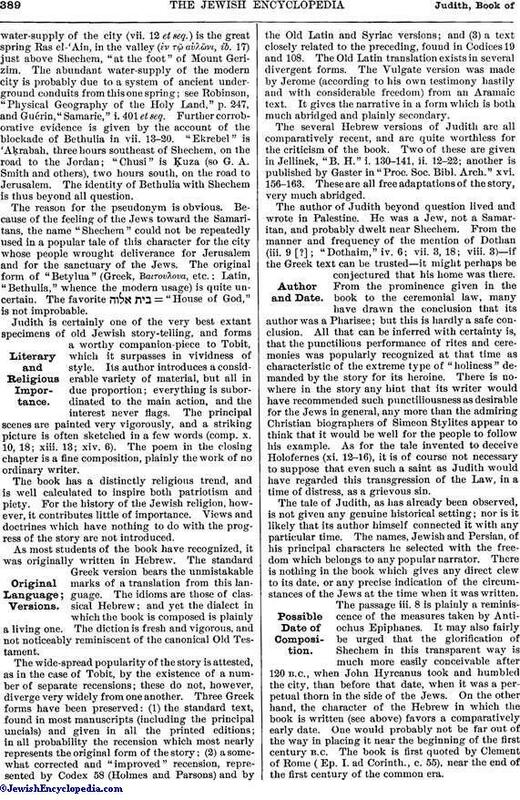 The author of Judith beyond question lived and wrote in Palestine. 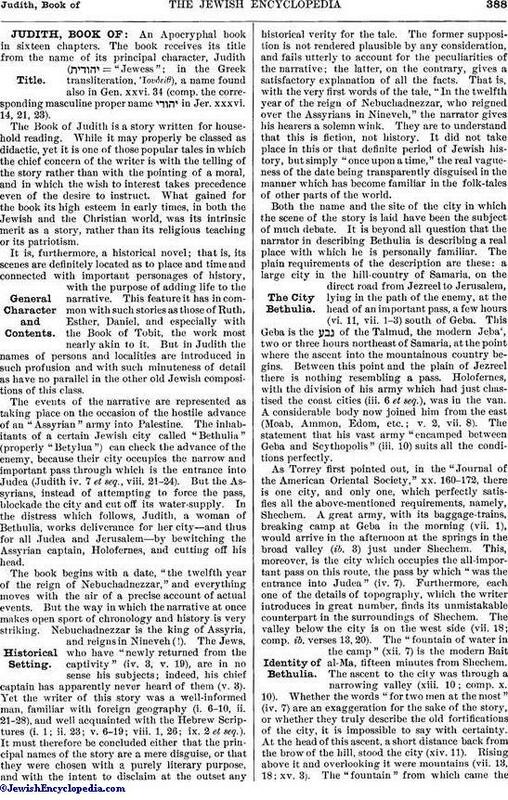 He was a Jew, not a Samaritan, and probably dwelt near Shechem. From the manner and frequency of the mention of Dothan (iii. 9 [? ]; "Dothaim," iv. 6; vii. 3, 18; viii. 3)—if the Greek text can be trusted—it might perhaps be conjectured that his home was there. From the prominence given in the book to the ceremonial law, many have drawn the conclusion that its author was a Pharisee; but this is hardly a safe conclusion. All that can be inferred with certainty is, that the punctilious performance of rites and ceremonies was popularly recognized at that time as characteristic of the extreme type of "holiness" demanded by the story for its heroine. There is nowhere in the story any hint that its writer would have recommended such punctiliousness as desirable for the Jews in general, any more than the admiring Christian biographers of Simeon Stylites appear to think that it would be well for the people to follow his example. As for the tale invented to deceive Holofernes (xi. 12-16), it is of course not necessary to suppose that even such a saint as Judith would have regarded this transgression of the Law, in a time of distress, as a grievous sin. Porter, in Cheyne and Black, Encyc. Bibl.